Oh Elizabeth – what a thrill! The abundant cowl collar of this piece establishes it as a regal standout. Garter trimmed flame chevron lace (easily done) is inserted in a deep arc around the neckline framing the face in casual elegance. A shapely bodice, worn plain or belted, and bracelet-length sleeves add to its styling. This piece is slim-fitting and extends mid-hip in length with garter trimming at the hems. Worked bottom-up, the lower portion begins as one piece on circular needles, until the start of the front neckline where it splits and each side is worked separately. 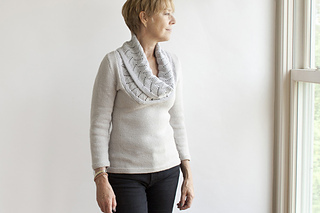 You’ll find this project works up quickly – a pleasure to both make and wear. Enjoy! Shown in Lark wool by Quince & Co.,100% wool; 134 yds (123 m) per 50g skein; color – Frost #103; 9, 10, 11, 12, 13, 14, 14 skeins, or for comparable yarn, approximately 1180, 1310, 1415, 1540, 1665, 1775, 1890 yards; I always buy extra. Knit, purl, circular knitting, yo, k2tog, ssk, p2tog, p2tog tbl, m1r, m1l, stitch pick up around neckline, short row shaping at shoulders, blocking, and seaming. 12 page pdf includes pattern instructions, photographs, schematics, lace pattern description and chart, assembly diagrams, and relevant abbreviations.